Next time you take a walk through the grocery store, take a look at the packaging — especially on relatively expensive items. Any item with a lot of packaging always costs more than its counterpart without. Hamburger Helper offers a great example: not only does it come in a box, but there are packets within the box. Compare the price of a box or bag of pasta, with less packaging, and a few spices (which is not all that far off from what Hamburger Helper is). In such cases, we aren’t just paying for packaging — of course convenience is a key pricing factor — but the connection is still there. One of the easiest strategies is to buy in bulk when possible. The packaging on small, convenience-sized containers of common staples — like oatmeal — adds up very quickly when you compare it to the packaging on one large container. Another option is to choose to buy from locations that don’t rely as heavily on packaging. For instance, at many farmer’s markets, you simply bring your own bags. Similarly, many food co-ops actually require you to bring in containers to purchase certain items, like grains. There are even a few grocery stores that offer you the same option. Investing in a few reusable bags and containers can help you get away from buying pre-packaged foods. Lastly, cooking from scratch can be a key strategy in minimizing packaging. There’s far less packaging on "ingredients" (which also happen to be cheaper) than on mixes and meals that are practically ready to go. It is important to make a conscious decision, however, if you want to stop paying for packaging on your food. It’s very easy to have a blind spot when it comes to the paper and plastic your food comes wrapped up in. Unless you’re paying attention, a small jar of mustard and a big bottle will seem to have roughly the same amount of packaging materials. But when you consider their relative size, one size certainly requires more jars than the other. There’s additional value in reducing the packaging we buy than simple costs. There is no doubt that there’s a huge environmental impact made by each piece of packaging that winds up in the trash and even recycling such items isn’t the best option. The best solution is to not use more packaging than is absolutely necessary in the first place. It’s not always an option, but making an effort to focus on reusable packaging or less-harmful packaging is a step in the right direction. 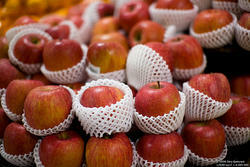 You can minimize the plastic packaging you need, for instance, without hurting your own bottom line.